The Game Developers Conference 2013 is packed with new game releases, announcements and also hardware launches. AMD took to the stage to announce its latest and greatest graphics card, the AMD Radeon HD 7990, which will go against the GeForce GTX Titan. While it was a big announcement, the real highlight of the reveal was AMD’s new line of cloud graphics cards, the AMD Radeon Sky 900, Sky 700 and Sky 500. 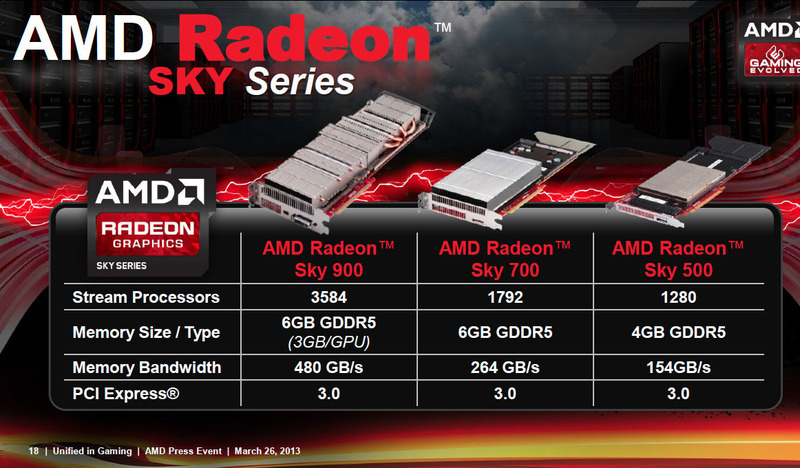 The AMD Radeon Sky 900 will come with a whopping 6 GB of GDDR5 memory and a memory bandwidth of 480 GB per second. Just so you know, the 1000$ Nvidia GeForce GTX Titan, the current fastest graphics card on the market has a memory bandwidth of 288 GB per second. So either way you see it, that’s an insane amount of processing power. You’re not going to see the Sky 900 in anybody’s home, it will be seen only in server farms for cloud based gaming. So what are cloud graphics cards? How are they beneficial to us, the consumers and how is gaming on the cloud going to change everything? A few years ago, there was talk of a revolution in gaming, coming by way of a company called OnLive. This service allowed streaming of latest games to your home, and all you needed to do was get a set top box with a controller. The box itself wasn’t too powerful, it was just be a link between you and the servers. All the actual rendering work traditionally done locally like on a console or computer would be instead handled by a server and the data would simply be streamed to the client. This is the principle of cloud gaming, all the work is offloaded to servers while the client does minimum amount of work. So how do cloud graphics cards figure in the equation? These cards are far more powerful than usual graphics cards and come with a slightly different architecture to facilitate lower pings. That’s because multiple people will be connected to servers with multiple cards, and it’s not always going to be a one user per card ratio. Powerful cloud graphics cards like the Sky 900 will be able to render even super graphically intensive games like Crysis 3 or Tomb Raider without a hitch and allow them to be streamed to various devices. Many cloud services have already hopped onto the cloud gaming bandwagon and have signed up to use AMD’s range of cloud graphics cards. Cloud gaming has 2 very distinct advantages. One, it does not require a huge initial investment from consumers like what is required to buy a high end graphics card today. Two, it will allow even users with smaller devices or devices not usually capable of intensive gaming to play any game they like. There’s just one catch though, the client must have a fairly fast network connection with minimum latency, something around 5 Mbps is minimum. In this day and age that’s not a very large figure, so the only hurdles to cross are infrastructure and proper deployment. In the future, we could probably play any game we want on any device we have! 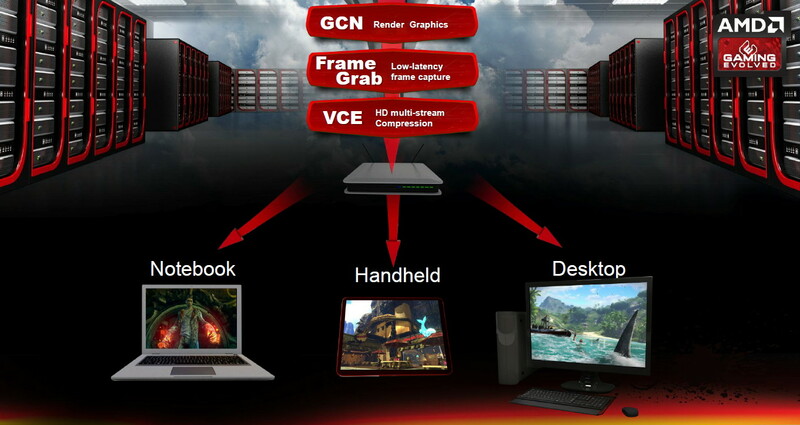 Cloud based gaming is the future and cloud graphics cards are essential for it to be possible. It will take a while before they will actually go mainstream, but with AMD’s range of cloud graphics cards announced, it might not be too far. Drop us a line on what you think about this development and let us know if you have any queries as well!